Here are 2 entries from the top ideas for the “new” chick tee contest! If you don’t know about the contest, see my prior blog post, “Chicks with Attitude” . I will be posting all of the entries this week. You can also read them all in the “notes” section of the Happy First facebook page.To vote, go to the “contests” tab on the facebook page. I love everyone’s ideas and charities! The adventure begins the day you are born. we are all, really, in a constant state of adventure! Whether you are taking your first steps, a cooking class, learning to jump rope, taking a stroll in the woods or snow skiing; one can find an adventure in it all. It is learning, teaching, moving, changing, growing and even loving. “Adventurous” is learning to cope with the unknown – what woman doesn’t have an adventurous spirit? My charity of choice would be Animal Rescue League. I feel our displaced animals are at humans’ mercy and they need all the blessings we can send them as they are totally dependent on humans for survival. My “Chick” line of tees has been growing by leaps and bounds! 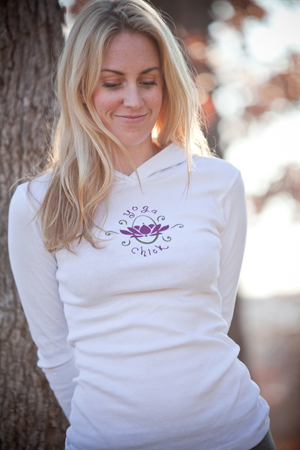 It all began with the “Happy Chick” tee and from there the ideas have been endless. We now have Runner Chick, Yoga Chick, Tennis Chick, etc (too many to name! Just look at our “chick” link on our Happy First site.) Everyone keeps coming up with new ideas. I think it is fun to wear a tee that says who we are or what we like to do-it reflects our mindset and hobbies. It’s an attitude! It invites others to come along and join the fun. We women like to spend time together with girlfriends and be part of a group. As women we have so many demands with family, work, volunteering, etc. that sometimes it is hard to carve out time for ourselves. One of my friends said once she had kids, it wasn’t about her anymore. We have to (and want to) put others first; but I think it is important not to lose ourselves. We need to find some things that give us joy and energize us so we are better at all the other things we do. I think I am a better wife and mom because I put some fun and friendship in my life and am pursuing various hobbies and adventures. There is not enough time in the day to pursue all the things I want to do-I am a runner, yoga, golf, okie chick! (I think more than that actually). Right now we are having a contest to name the next “chick” tee-we received over a hundred entries on our Happy First Facebook page and painfully (because they were all great!) narrowed it down to the top 10. The top 10 ideas are- Adventurous, Biker, Bling, Charity, Drama, Praying, Spa, Strong, Super, Zen. People can vote on Facebook and the winner will be announced on January 12th. Then we will get busy designing the winner tee. The winner will receive a free tee for herself and a friend, plus we will donate 30% of the proceeds from that tee (sales from January 16-March 31) to their favorite charity. Come join the fun and read what the top 10 had say about their “chick” idea and who their favorite charity is and why. They will be on Facebook and I will also feature them on our blog in the upcoming days. And then vote for your favorite and spread the word! And what kind of “Chick” are you? Pick the next Happy First “chick” Shirt & be Charitable! Happy November 1st my friends! I’ve missed blogging! So much happening, I will catch you all up soon. First I want to tell you about our fun promotion! Pick the next Chick shirt, and win money for your favorite charity! ps-click on the ecard to send to friends free! Happy May 1st, May Day and anniversary! Happy May 1st! 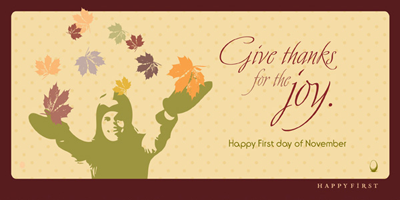 As many of you know, if you are on the Happy First email list or Happy First facebook page, I celebrate the first of the month with an ecard! That is why I named my business Happy First! It is all about new beginnings, starting over and appreciating the fact you are here and can do something with your life! I have a new ecard on the first of the month that you can share with friends for free! 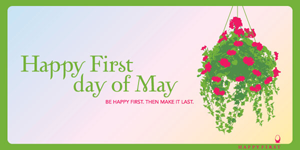 Just click on the Happy First day of May ecard on the left! It is all about spreading happiness! It is also May Day! I think May Day is my favorite day of the year, even though I have never celebrated the tradition of dancing around a maypole or leaving flowers on neighbor’s doorsteps. I love that idea though! hmm, maybe we should give flowers to our friends or something on May Day! 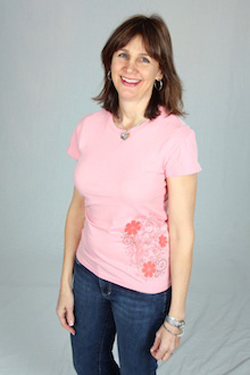 Or maybe a Happy First floral tee, that’s an even better idea! May 1st is my favorite day of the year because to me it represents Spring and flowers and school almost being out! And another reason to celebrate-it is Happy First’s 4 year anniversary! It has been an incredible journey so far! I have met the most amazing people along the way. It is fun to see where my business is taking me and how it is evolving! To celebrate, I am having a sale at the Happy First store-25% off sitewide through May 8th-great time to shop for Mother’s Day too! Anyway, just enter the code “anniversary” upon checkout. Today I am writing this from the Colorado Springs airport. My husband and I just had the best time at the Earl Klugh Weekend of Jazz at the Broadmoor. It is our 5th year to go. We had an incredible time-along with Earl Klugh we saw Peabo Bryson, David Sanborn, Brian Culbertson and Nnenna Freelon. We just loved it! They have many activities over the weekend-my favorite is the morning yoga classes. 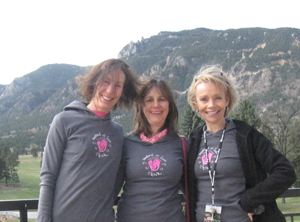 We have gotten to know Earl and Denise Klugh over the years and for the past 3 events, Happy First has made “Jazz Chick” hoodies for them. I am so honored. It is so fun to see people wearing them!